It is pretty common to just type a search term in your address bar to search Bing/Google/etc. Instead of searching just to end up at TechNet, just search TechNet to begin with by adding TechNet as a search option in IE! First visit EnhanceIE.com. Skip down to Step 3 and enter http://social.technet.microsoft.com/Search/en-US?query=TEST&ac=3 . Name your search option something like “TechNet”. Finally, press Install. You can now search in the address bar and select the TechNet search option to jump straight to TechNet. There are a few options to finding specific group policy settings. The first option is to download the excel reference guide for your server/client level. As a positive, the filters are great in it! As a negative, it can be a little overwhelming at first. 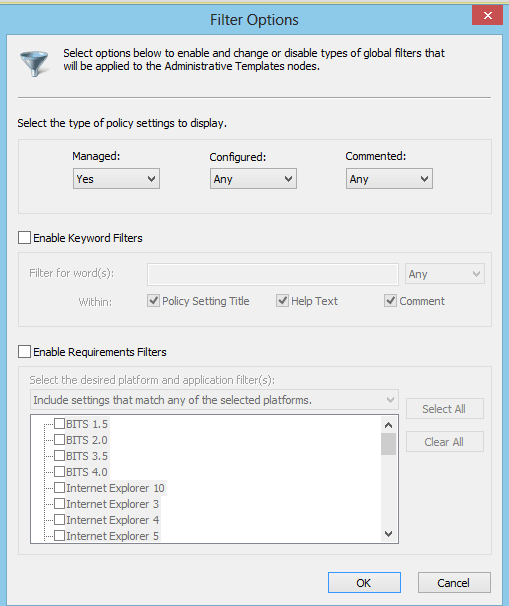 The second option is to use the filtering option in Group Policy Management Editor. This is done by right clicking on Administrative Templates (while you are editing the GPO) and selecting Filter Options. Select Enable Keyword Filters, type in your search, and press OK. Administrative Templates will not filter down to just your search terms. As a positive, this search feature is built right into the GPO editor. 99% of the time, you will be in the editor when you are searching for a specific setting. As a negative, the search feature is limited in terms of scope. You can’t search across user or computers settings as the same time. The final option is to use GP Cloud Search. This option is a web based version of the excel reference sheet but is organized by the actual GPO structure. So you can literally browse it in the same format as you would edit a GPO. Out of these three methods, I prefer the web based search option the best. Why you ask? Because I can also add it as a search provider! If you would like to do the same, head back to EnhanceIE.com. On step 3, enter http://gpsearch.azurewebsites.net/default.aspx?search=TEST . Name your search provider and press install. Now, within IE, I can easily search TechNet or the Group Policy CloudApp! If you have a tip for finding technical info, let me know in the comments! To learn more tricks – jump over to part 2 of our search series!